Mastering making scones from scratch can be a little tricky. Like all baked goods, a lot can go wrong at each step, throwing your recipe into a tailspin. Perfect scones are a little crumbly and best enjoyed fresh from the oven. Amy Lawrence, an accomplished afternoon tea cookbook author and the founder of ​An Afternoon to Remember shares her tips on how to make scones that are flavorful, moist and beautiful. Once you have the scone-making basics down, following her advice is a great way to improve your scone-making skills even more. 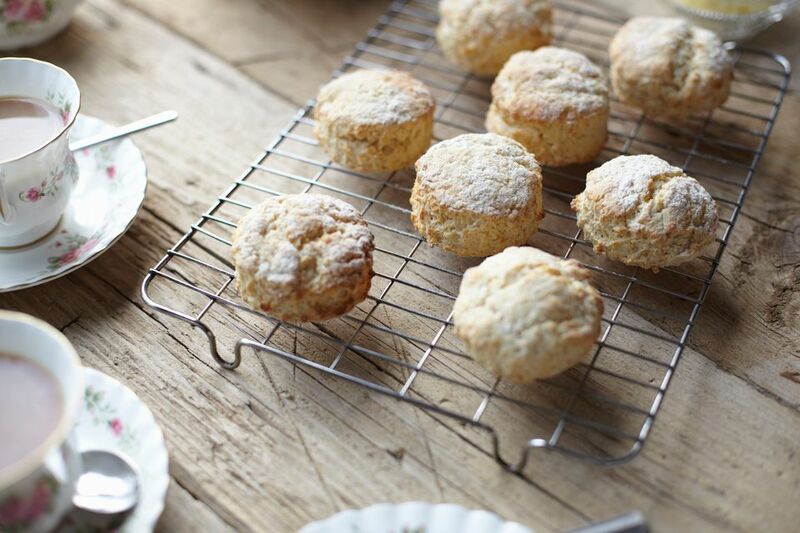 Here are Amy's tips for making the best scones every time. Self-rising flour is already salted, so if you're using self-rising flour, be sure to use unsalted butter. Don't soften your butter. Cold butter makes scones rise higher. If it's hot in your kitchen, freeze your butter before making scones. Cut your butter into cubes. First, cut the stick of butter down its length both vertically and horizontally. This will give you four small sticks of butter. Cut these sticks into cubes. Measure your flour with a scale or by scooping it out of the bag and into a dry measuring cup with a spoon. Do not pour your flour into the measuring cup or it will be too dense and you'll use more flour than you should. Be sure to drain your fruit very well. If you're using frozen fruit don't thaw it out before you mix it into your batter. If you're adding fruit, chocolate or other sweet ingredients to a basic scone recipe, use less sugar. If you're making scones with ingredients like canned pumpkin or mashed banana, use less buttermilk than you would normally use. Avoid using a food processor to mix scones. A pastry cutter works best. Just press it into the mixture, cutting the butter as you go and wiping the cutter clean of dough with your hand as needed. Start by adding half the called-for buttermilk to the dry ingredients. Lightly turn the mixture and add more liquid as needed. Add just enough buttermilk or milk (preferably low-fat) to make the dough stick together. The dough should still be crumbly with some flour dregs when it has enough buttermilk. Otherwise, the scones may come out tough. If you're using frozen fruit, and add it at the last minute (just before you cut the scones) to prevent its juices from melting before it gets into the heat of the oven. Avoid over-mixing the dough. Too much stirring will toughen your scones. Once your dough is crumbly, you can freeze it in a sealed plastic bag until you're almost ready to bake it. When you're ready to bake the dough, thaw it out, but do not microwave it (as microwaving it will compromise its texture). This is a good way to prepare scones for busy holidays and large events. For pink scones (for events like Valentine's Day or a girls' birthday party), puree raspberries and use them as a portion of your liquid ingredients. Move a chunk of dough from the mixing bowl to a floured cutting board. If the dough is too crumbly when you place it on the cutting board, add slightly more buttermilk. If the dough is too sticky when you put it on the cutting board, add more flour. Flour your hands and shape a chunk of dough into a disc. A larger disc will make a larger, more moist scone. A smaller disc will make a smaller, drier scone. Gently pat the edges of the scone to make it round. Don't compress the dough. Lightly press the top of the scone so it is roughly 1.5 inches tall and 8 inches in diameter, or smaller. Flip the disc of dough once. Cut it into eighths or score it into eighths and break it after it's baked. Alternately, you can cut it into hearts, circles or other shapes. Place the cut scones on a parchment-lined baking sheet. Shape and cut more scones until you are out of dough. Optional: If you have remaining flour dregs, you can add a very small amount of buttermilk to them and use them as additional dough. Keep the scones as cold as possible until they are ready to go into the oven. This will make them rise better. Make sure your oven is fully preheated before baking the scones. Bake large scones for roughly 12 to 20 minutes. Bake smaller scones for about eight minutes. Baking times vary with different ovens. You can tell when scones are done in either of two ways. First, the scones can be pulled off of the pan easily with little sticking. Second, the insides of the scones are no longer doughy.